Well, there isn’t much to say about my knitting other than that I’m still slowly making progress. I should have it finished by Christmas 😉 And at least I’m not getting tired of the pattern or the yarn, I’m just tired of not getting to work on it. And now I’m off to see what other trouble I can get into checking out Ginny and the other Yarn Alongers 🙂 There’s always so much to see. This entry was posted in books, Yarn Along. Bookmark the permalink. there is nothing wrong with having a huge pile of books. They are lovely to look at and each one gives a promise of being entertained 🙂 Glad to know you are getting snippets of time to knit! i tend to have a nice big pile of books going as well. enjoy your reading and i hope you find time to knit! 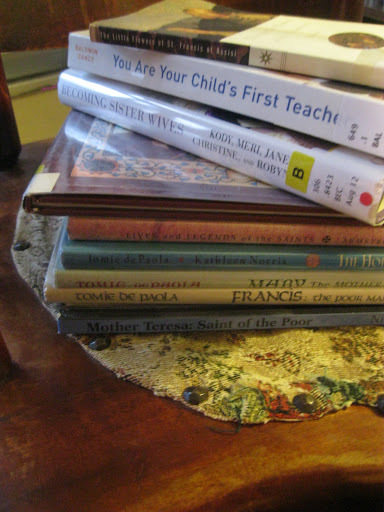 Love that stack of books, I want to read You Are Your Child's First Teacher.